You are currently browsing the tag archive for the ‘Trident Maple’ tag. Spring in the middle of winter? It’s a strange season. Here in Australia we are in the middle of winter, yet in my garden some of my trees think its spring. For what ever reason, my trees seem to be ahead of schedule by a couple of months. My Chinese Quince dropped its leaves in autumn and almost straight away began to leaf out again and is now almost back in full leaf. I guess this means that at least for some trees I will have to move the re-potting window forward a little to keep up with their early movement. 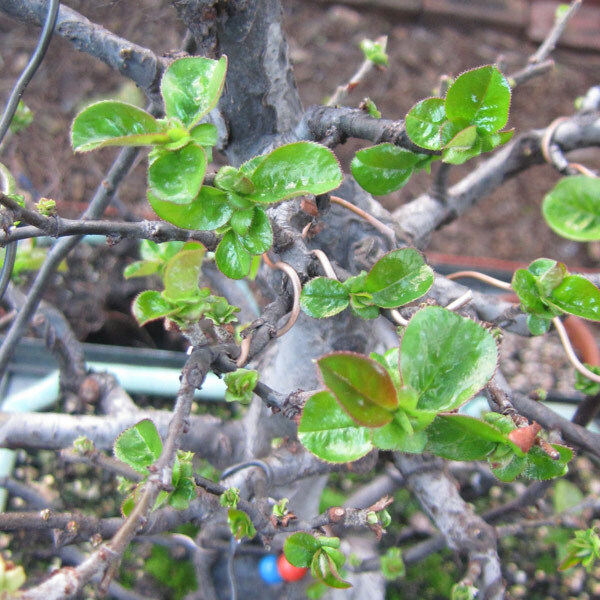 I think next year i will re-pot the Chinese Quince as soon as it drops it’s leaves in case it decides to move early again. Are any other Australians seeing an early spring? I wonder if these trees leafing out early will make for a big year of growth or if their lack of winter sleep will mean they are weaker than those trees that are taking the full winter sleep? It will be interesting to see what happens this season. 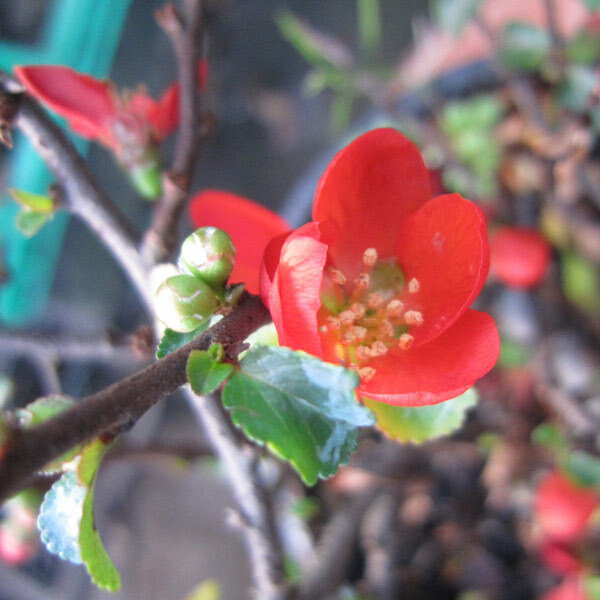 Another point of interest in my garden at this time of year is the ‘Choujubai’ flowering quince which although flowers throughout the year really blooms out in a big way now. It’s a nice splash of colour in amongst the bare deciduous trees. 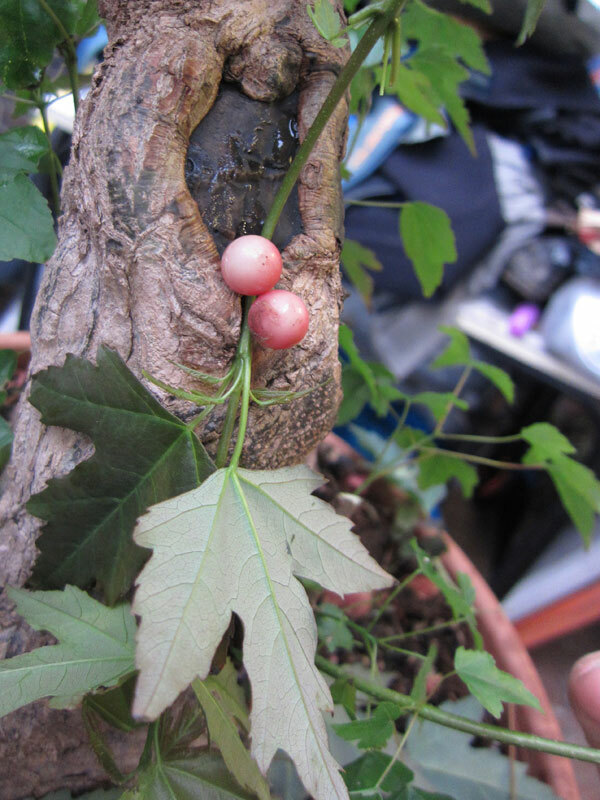 I had been hunting for ‘Choujubai’ in this country for a few years before finding one being grown by a friend. I am really enjoying it even though it is just a piece of stock at the moment. I hope to take a number of root cuttings this spring but perhaps that is the topic of a future post. I though it about time I updated how the grafts I did back in November were taking. If you look back at THIS post you can see the whole process of how I started this graft. The graft is beginning to take. 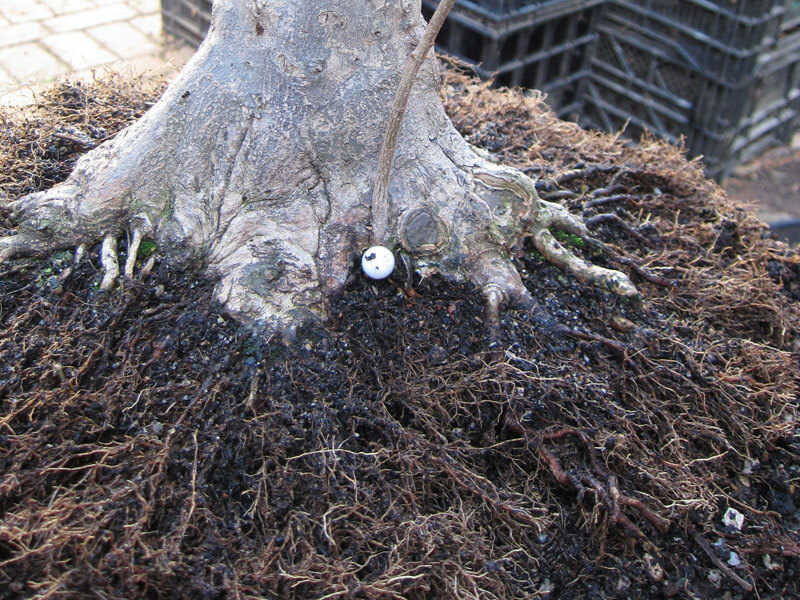 A week or so ago I had to do a demonstration on approach grafting for a local club so I took this tree in as an example and also placed some new grafts onto other areas of its trunk. It was a strange night as we had an earthquake in the middle of my talk. It was a small quake in world standards (5.4 on the Richter scale) but it was the first I had felt. The building shook, doors rattled but it only lasted for about 30 seconds and the talk soon continued. It certainly added an interesting break in the night. Now that the earth has stopped shaking and im not in front of a meeting group I am able to see how the graft is doing a bit more closely. The graft has begun to take but I think that I will leave it attached to the host branch for at least part of this growing season (ie. next spring). 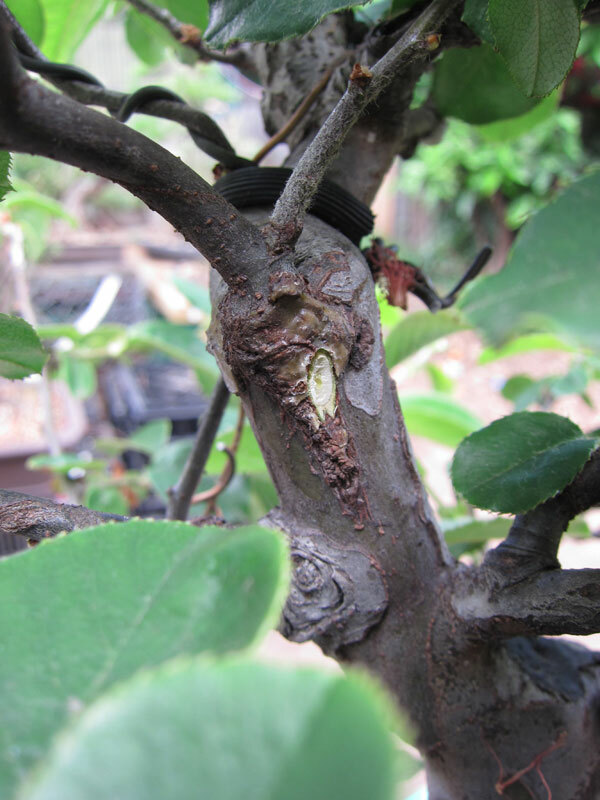 You can see in the above photo that the section after the graft is beginning to grow thicker than the host branch on the other side of the graft. 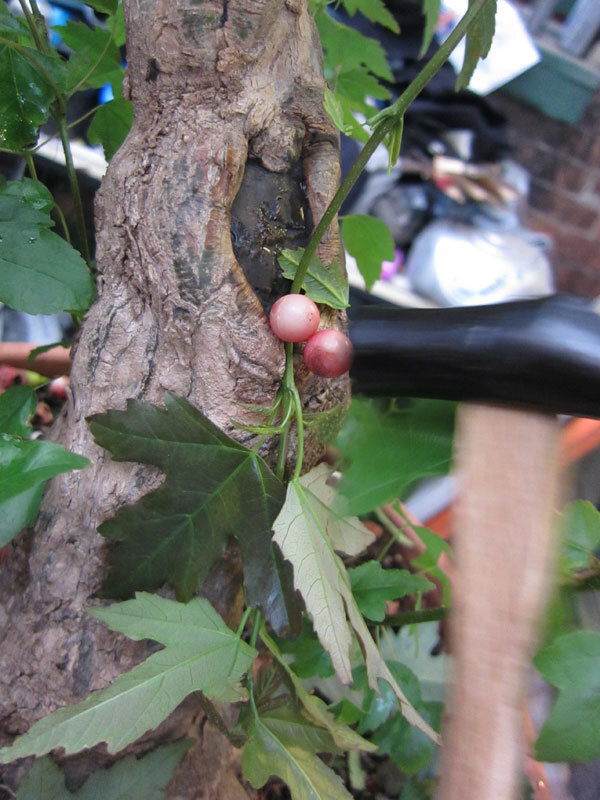 This is a good sign that the grafted branch is beginning to take nutrients from the main trunk. Once it becomes a little thicker I think the union will be much more solid and I will be able to remove the host section of the branch. I will be doing a whole lot more grafts on this trunk this coming spring so I can begin to build the framework of the branch structure. It really is an easy almost foolproof technique that allows you to get branches where you want quickly. If you have a tree that could benefit from a new branch, give it a go. 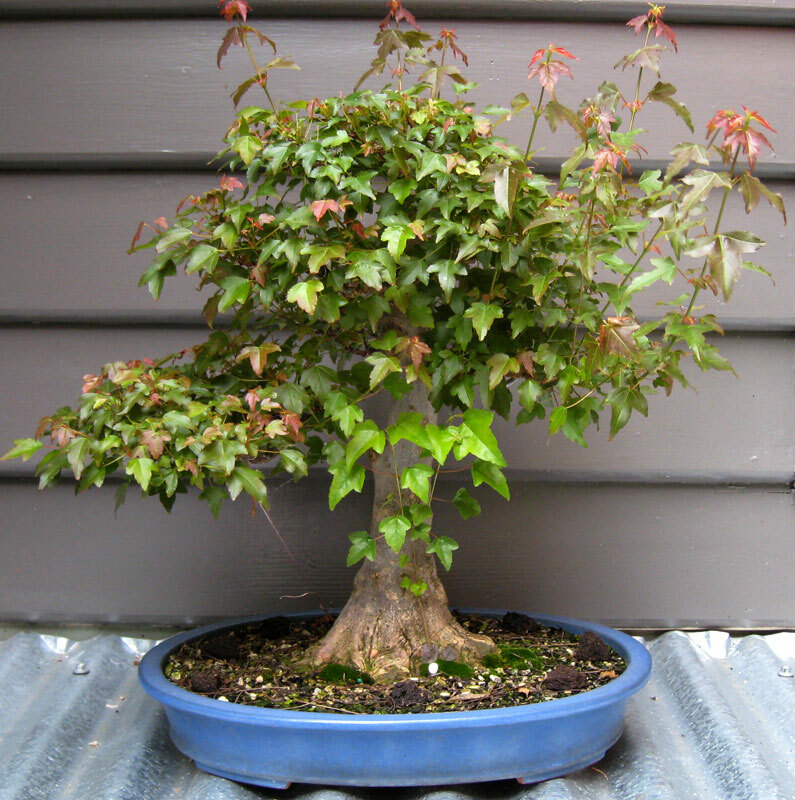 The following trident maple was ground grown by a friend. 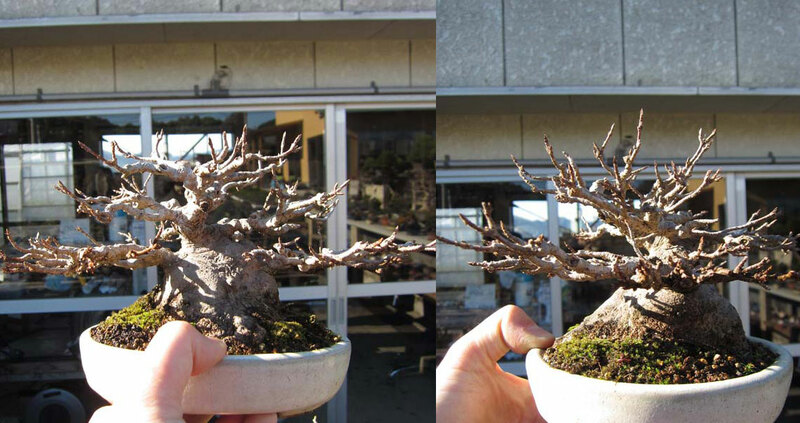 Since digging it up I have slowly been preparing it for its future life as bonsai. 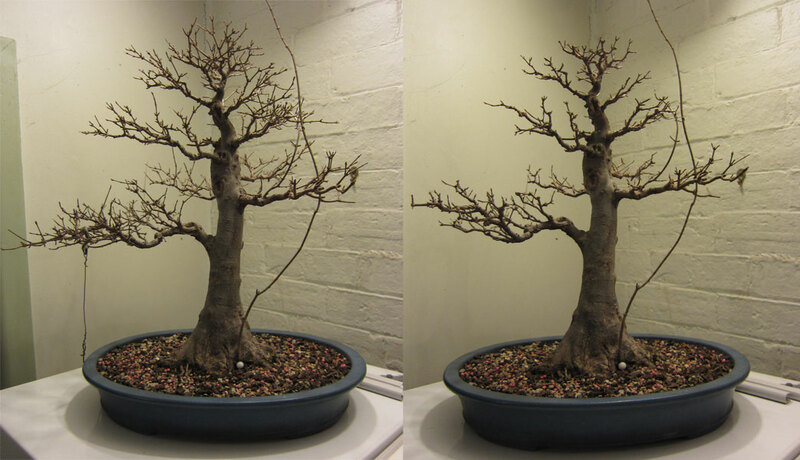 One of the things I wanted to do this year was to set a first branch in an area where there was no branching. I used a rough version of approach grafting which I hope to explain below. Now the method I am using is not as exacting as it could be. 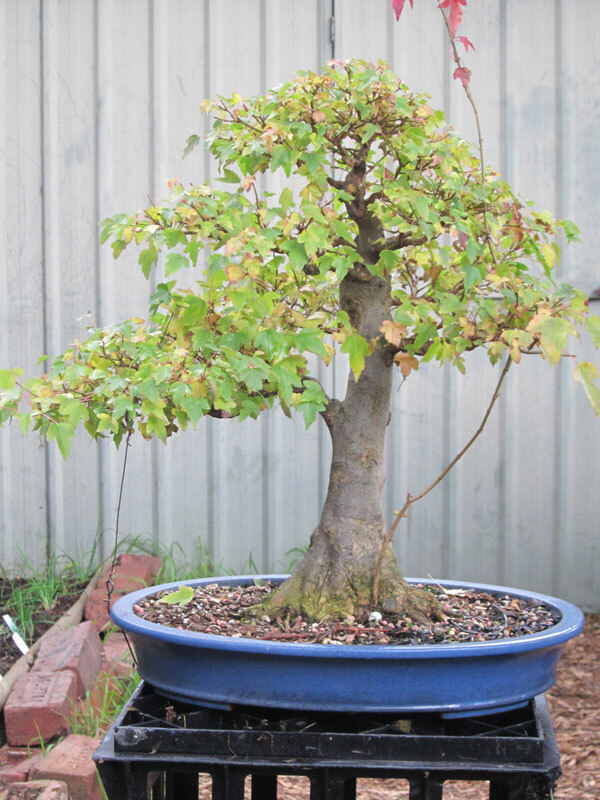 The reason for this is the species I am using (Trident Maple). Tridents are very fast growing and forgiving. They also fuse very quickly which is the trait I am hoping to take advantage of in this instance. Approach grafting is a fairly straight forward technique. I wrote about it in regards to conifers in two parts HERE and HERE. To approach graft conifers you have to be fairly exact when lining up the cambium layers. Using the below variation you can be a bit less exact if using thin barked deciduous trees. Firstly you cut a channel roughly the width and depth of the whip you wish to graft. 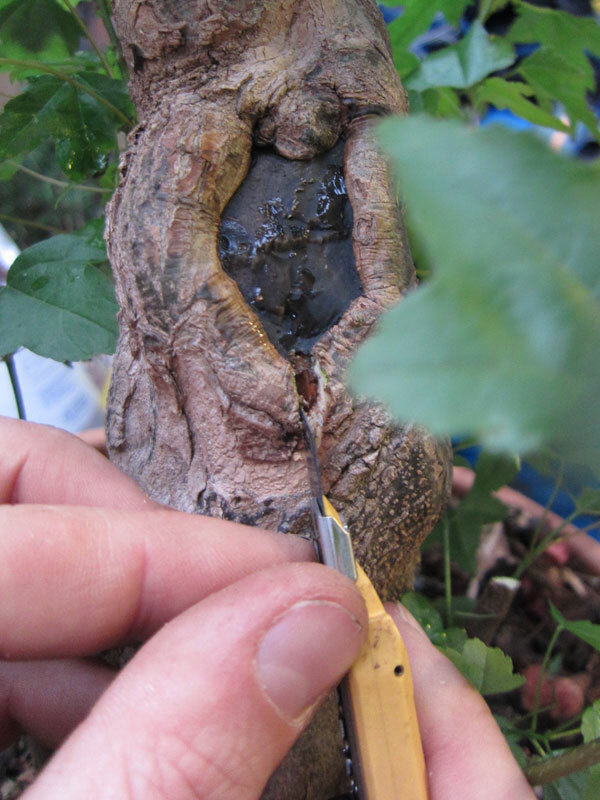 You then insert the whip and secure it in place so that as it grows it is forced to grow into the cut channel, during which time it grows together with the trunk, fuses and makes the graft. 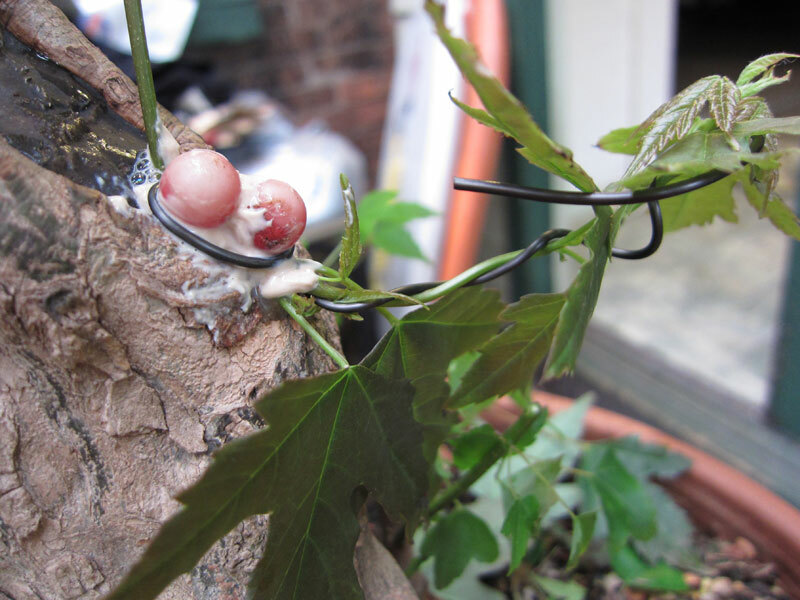 In this example I used map pins to secure the graft. I find that the round surface of the pins heads does less damage to the growing and thickening whip than using square-headed pins or those with sharper edges. In this case two pins were used to secure the whip. As Trident maples grow quickly and have relatively thin bark the whip and cut channel should graft together in a relatively short time as they heal and thicken. What is good about this technique is you can use very young whips as you do not need to expose the cambium layer. By not having to expose the cambium layer you avoid having to expose a large percentage of the cambium in the form of a wound and therefore increase the chance of the whip surviving and growing strongly. Sealed, wired and ready to grow. 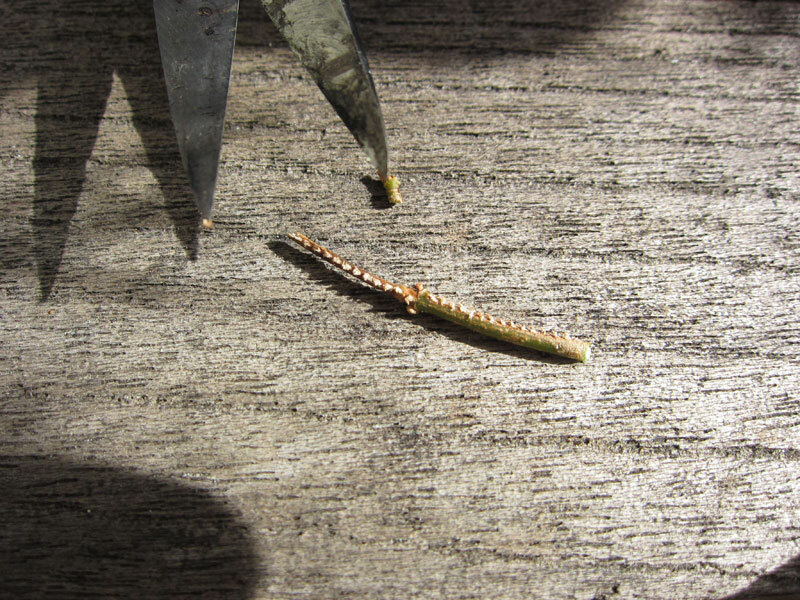 After setting the graft I like to lightly wire the whip and direct the tip upwards to ensure it will grow both strongly and leave the graft site at a desired angle. 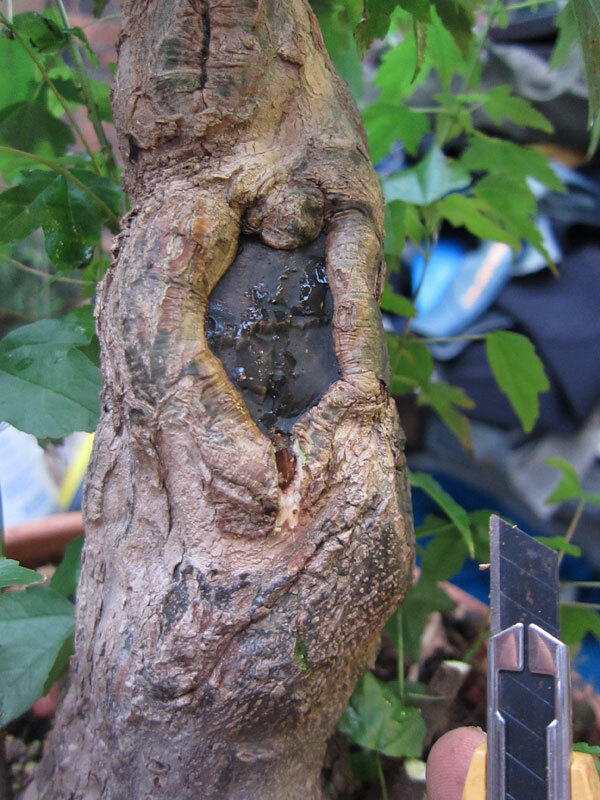 This graft will be left to grow for the season so it can thicken, fuse and graft itself onto the trunk. I will cut it off the parent whip once I can see a difference in thickness between either side of the graft site. As the graft begins to take it should start to draw sap from the trunk and become noticeably thicker from the graft site onwards. After I finished placing the graft on the trident maple I decided it was also a good time to clean up a graft on a Chinese Quince from last season. 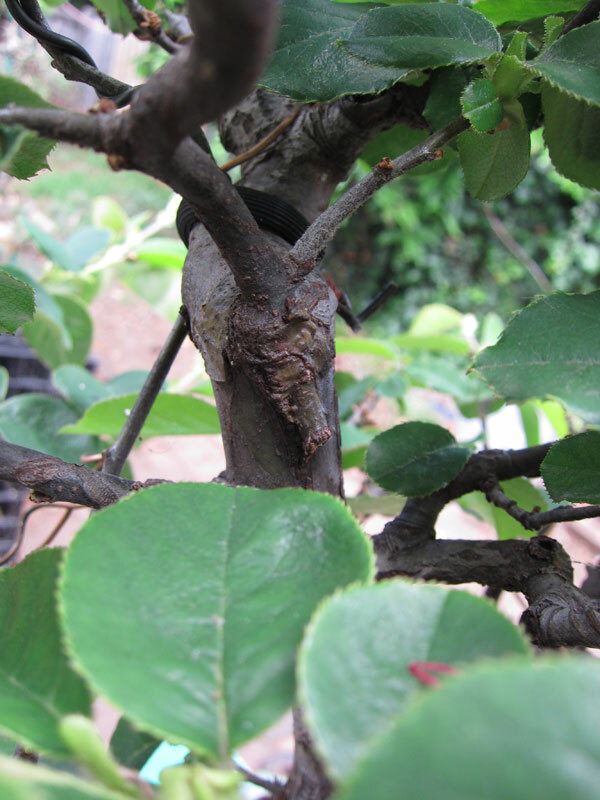 If you look closely you can see the difference in thickness between the grafted branch and the stub that use to be connected to the parent whip. You can just see the stub below the branch junction where the whip was cut once it had taken. I like to leave the stub on for a while until I see the graft growing strongly. I think keeping wounds away from the graft site at least until you are sure the graft is successful is a good idea. To complete the process it is as simple as cleaning up the stub from where the whip was once attached and sealing the wound. Once the wounds heal and the graft grows for a season or two it will become increasingly difficult to tell that it was a grafted branch. It is a very simple process all in all and one I use quite often. It can be used with a range of thin barked deciduous trees that show signs of fusing easily. It is an easy technique to do and most of the time returns great results. 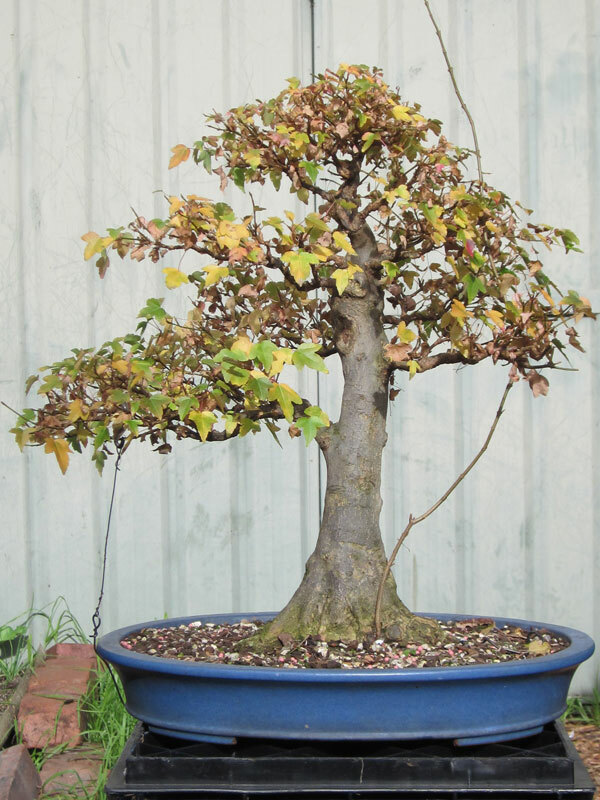 Some example species to try might be, Trident Maple, Japanese Maple, Chinese Quince, ficus species and other species with similar bark traits. Spring is certainly around the corner and all my trees seem to know about it. They are for the most part starting to swell their buds. As a result I have been re-potting. 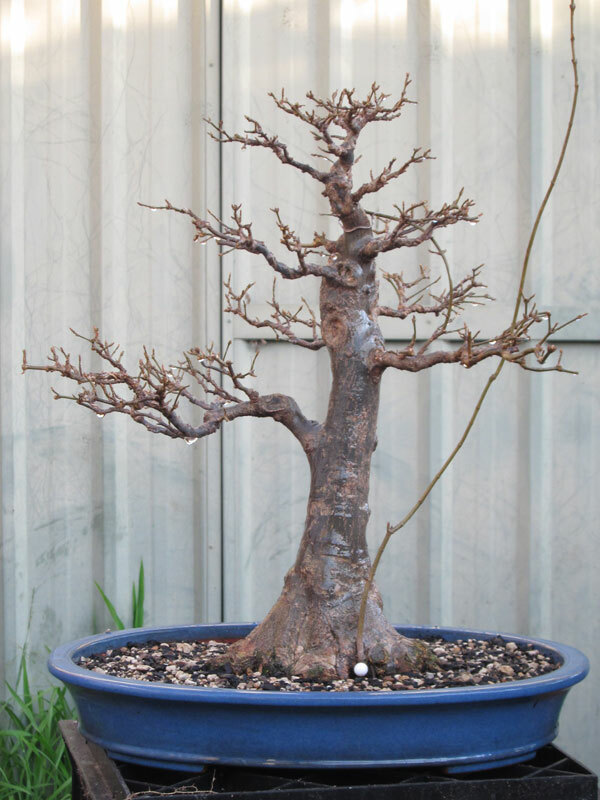 I re-potted one of my trident maples a couple of days ago to get it ready for the springs growth and thought I would share some pics of the process. The bottom side of the rootball before and after the work. Once the roots are all in order you can continue to pot up the tree. In this case it went back into the same pot. 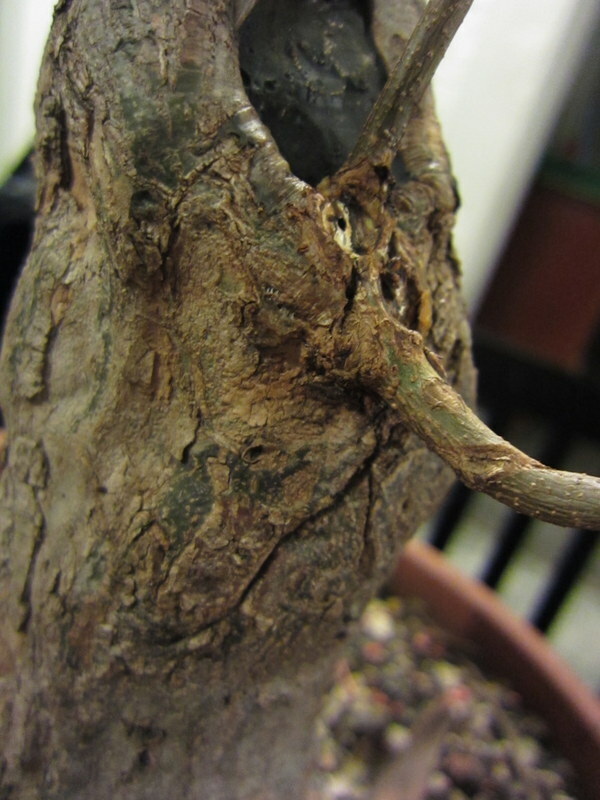 Another year and another re-potting…..
Winter is a hard time for me and my bonsai. For the most part, when I arrive home from work it is dark and cold. This makes working on my trees something I only tend to do on weekends. 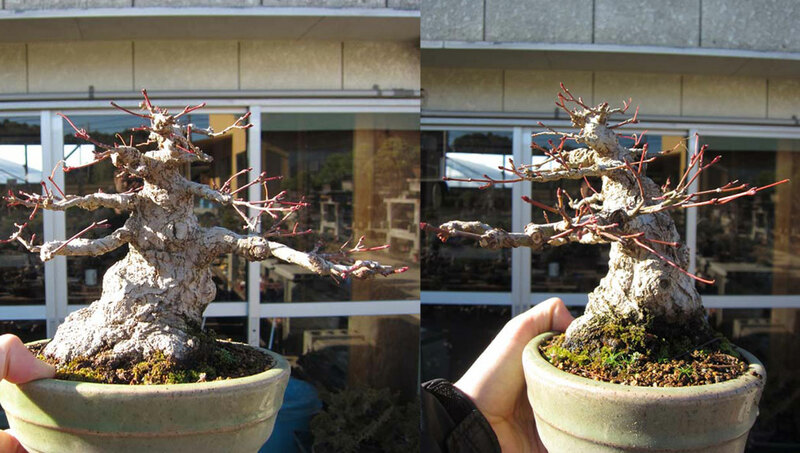 That being said I did get motivated one night after work to do some pruning on my Trident Maple (seen here and here). Tridents grow quite quickly and within a year they can put on a lot of twiggy growth. A lot of this growth is not suitable to build future ramification on so it must be pruned off. 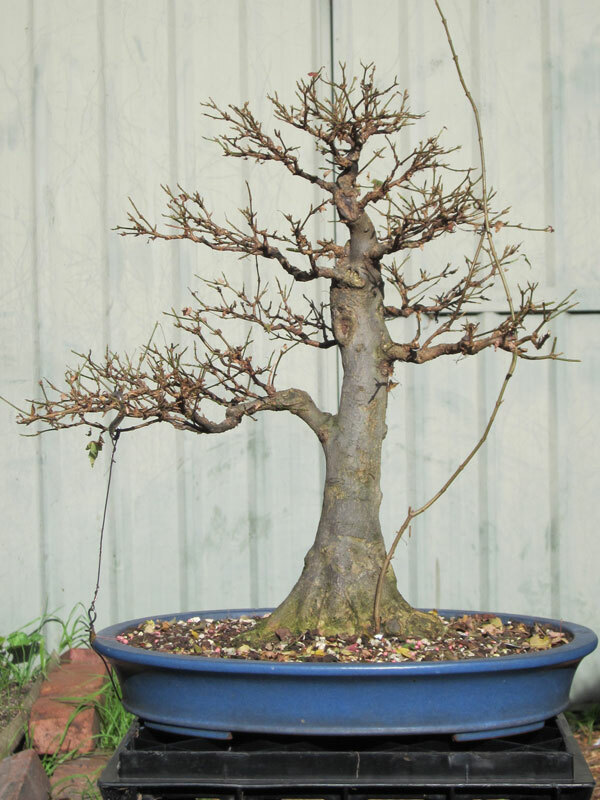 Quite often it seems like you are taking two steps forward and one step back but the removal of twigs that are not formed correctly will ultimately make for a better bonsai in the long run. 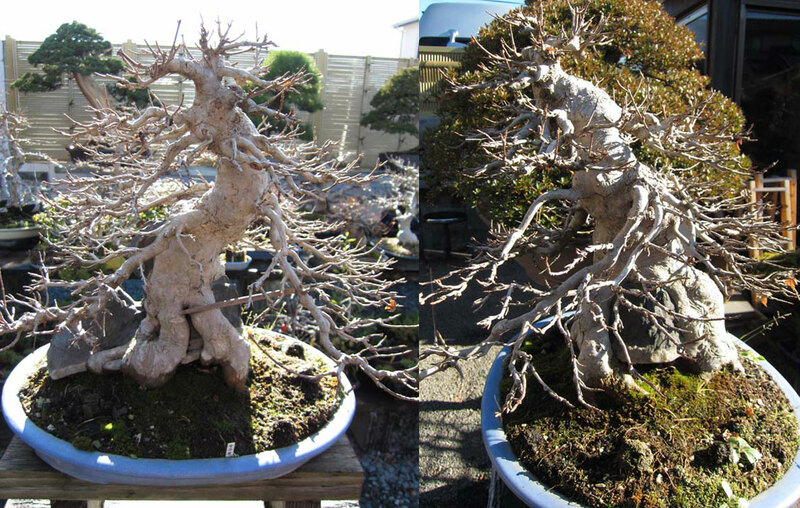 Before and after pruning. The red lines show approximately where I made cuts. At this point in this trees life I am looking to start to build fine twigs. Most of the vigorous growth over the last year has helped to form secondary branches but it has grown with internode gaps that are too long for the tips of a branch. As a result I have pruned to remove these long internodes, reduced all branch divisions to two and generally tried to form a better structure within the branch. A lot of my trees were grown a little too quickly and as a result their branches do not have as good a structure as they might. I am now cutting a fair amount of those branches back and trying to correct the structural problems. One of the main problems I have in my trees is that the branches do not have a main branch line with sub branches but instead have several main lines. This makes the branches look full very quickly but in the long-term you do not get the taper and look you would if the branch was grown otherwise. It all comes back to pruning. Sometimes you have to set a tree back a little in order for it to progress. This tree will be re-potted in the coming months and may also have its branches fine tuned a little with some wire which should then make it ready for the start of spring. 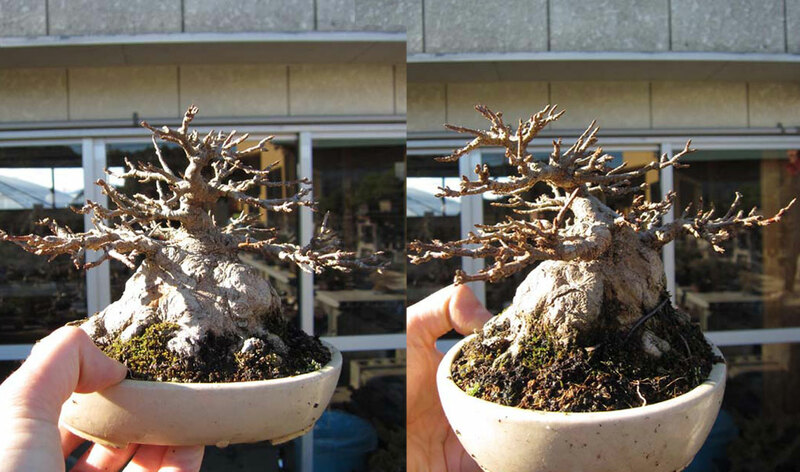 This year has seen some dramatic changes to my bonsai. The most major of these was moving house and gaining some backyard space. My trees previously were kept in amongst a lush garden. On one hand this was good in that my bonsai were quite sheltered and there was a good micro climate in which to grow amongst. The down side was that I could never really rid my trees of pests as once the garden was infected everything was. As a result my trees ended up with a number of pest problems. 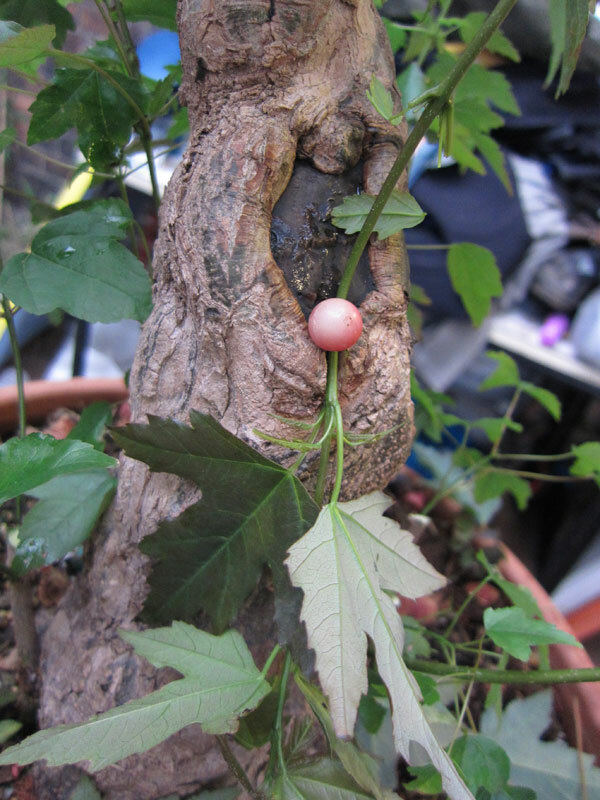 Now I have moved I hope to rid them of these problems, which brings me to the subject of this post, my Trident Maple. 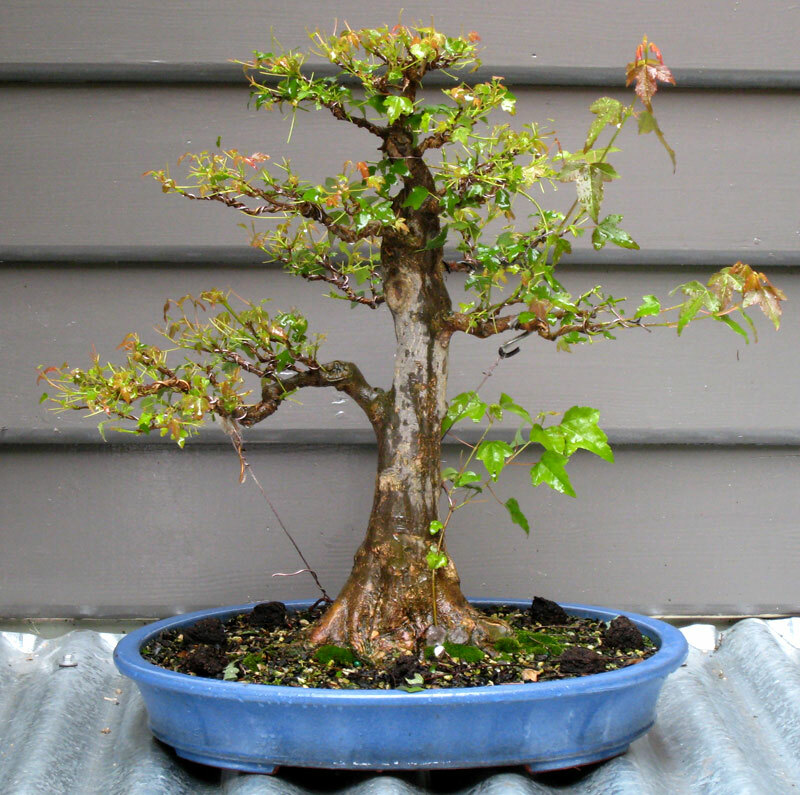 Earlier this spring I defoliated the maple and posted the results HERE. I repeated this defoliation process twice more during the season and was rewarded with much increased ramification. As it began to change into its Autumn colours I set about doing the final defoliation. Usually I would leave the leaves on a little longer in order to see the full range of colours they would turn but I wanted to remove them before they dropped so I could dispose of them along with any insect eggs that may have been laid on them. The trident at the beginning of autumn just beginning to show signs of it changing colour. I removed all the leaves which revealed the structure of the branches and all the new ramification. All the leaves that were removed were put into the household garbage to ensure that any eggs on them would not end up anywhere near my bonsai. Once the tree was naked I was able to carefully look over the tree to assess the amount of pruning that would be required. I wanted to spray the tree with lime sulphur to kill any remaining pests so I did not prune at this stage. I don’t like the idea of lime sulphur getting into fresh cuts. I am not sure if it is actually a problem or not but I choose to avoid it where I can. What I did prune off was some insect eggs. I found what I first thought were fungal blooms on dead twigs. If you look closely you can see the small white tufts of damage. Upon further investigation I realised that the tufts lead to a hollow channel within the twig which was filled with eggs around 0.5mm in size. I did a quick search on the net and realised they were the eggs of Passion Hoppers which lay their eggs in channels they make within small twigs. 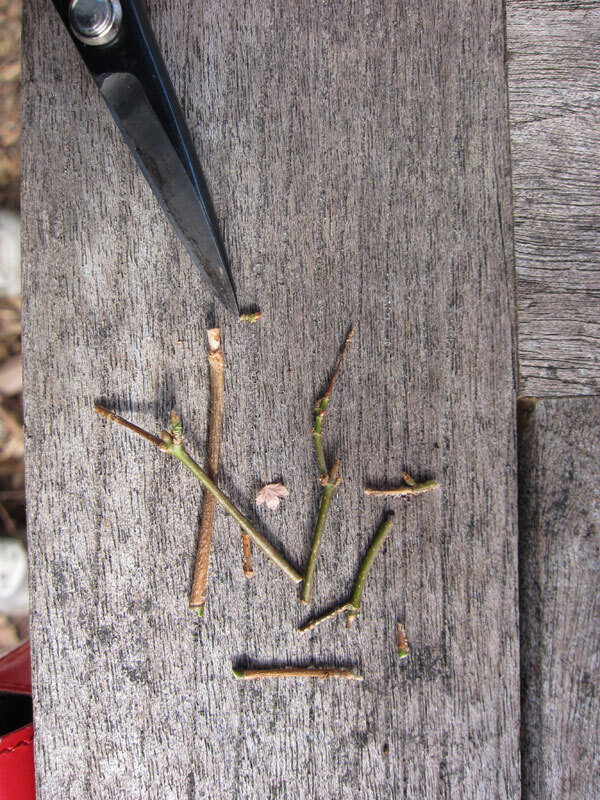 The twigs die soon after the eggs are laid so cutting the twig off and destroying it is a good way to tackle them. I then went over the tree with a pair of scissors and removed every twig I could find that exhibited signs of damage. A pile of some of the damaged twigs. 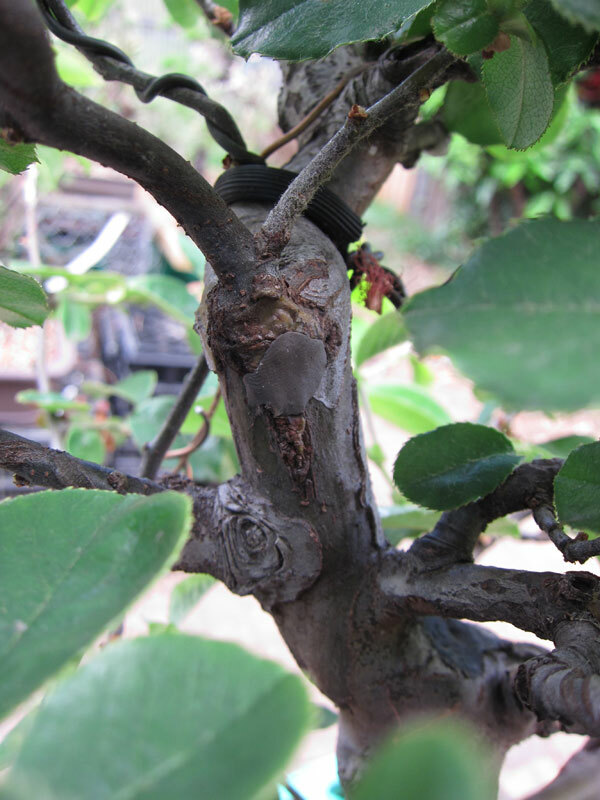 After removing what I can only guess was hundreds of insect eggs I sprayed the tree with a diluted solution of lime sulphur to prepare the bonsai for winter. It was a satisfying days work. I hope that the work will pay off next season with a dramatic reduction of insects in my collection. Fingers crossed. This spring is much wetter that what we have become use to over the last 5-10 years of drought. This drought breaking rain that we are experiencing has come as a welcome beginning to this seasons growth for my bonsai. They are all growing like crazy. Judging from what i have seen in the month or so since spring has started i am guessing that we are in for an excellent bonsai year ahead. One of the trees that has been growing strongly is the trident maple that is pictured below. It has been growing so well that i have decided to defoliate is a little earlier that i normally might in the hope that i will be able to defoliate two or even three times to encourage far more fine ramification i would get in a normal growth year. 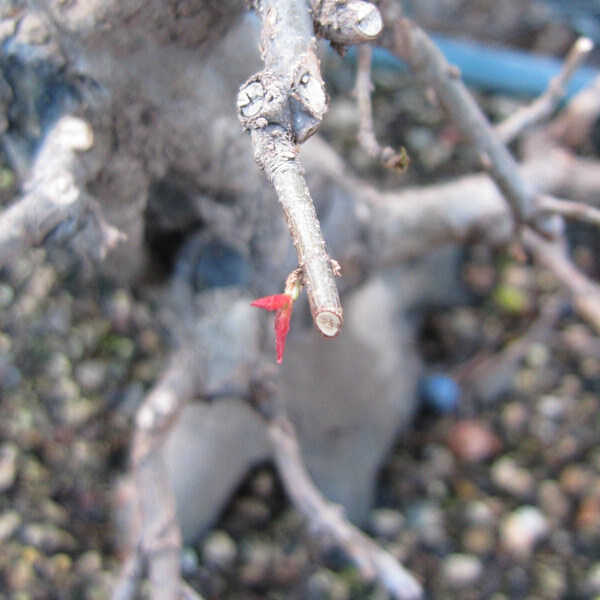 If you look towards the base of the tree you will notice a small seedling that is being grafted into the nebari to fill in a small gap in the root spread. I have been growing this tree for a number of years and it is really starting to become on of my favorites. This year i rewarded it with this old ‘Reihou’ tokoname pot that i bought on my last trip to japan. I think the blue really suits the tree well. I will make a separate post about this and other pots in a subsequent post. This is how the tree looks after defoliating it. 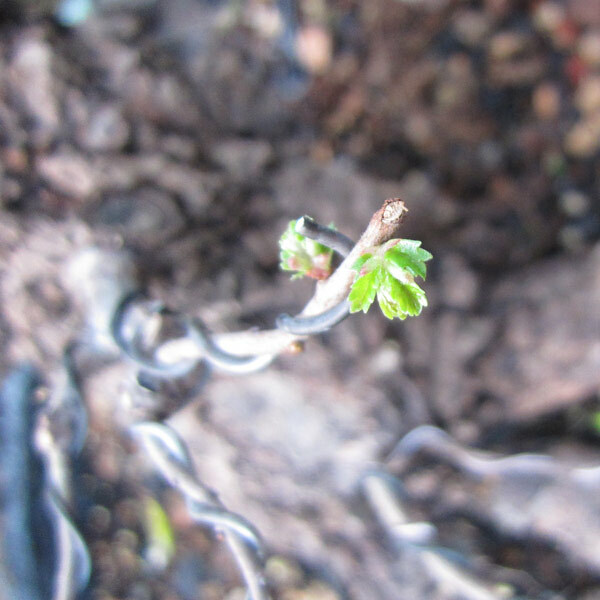 I have left leaves on the shoots that were weak in order to give them a head start over the new growth. This ballancing of shoot strength should even-out the energy distribution over the trees canopy. I also like to add a few more fertiliser cakes to the tree after defoliation to help the new buds form. 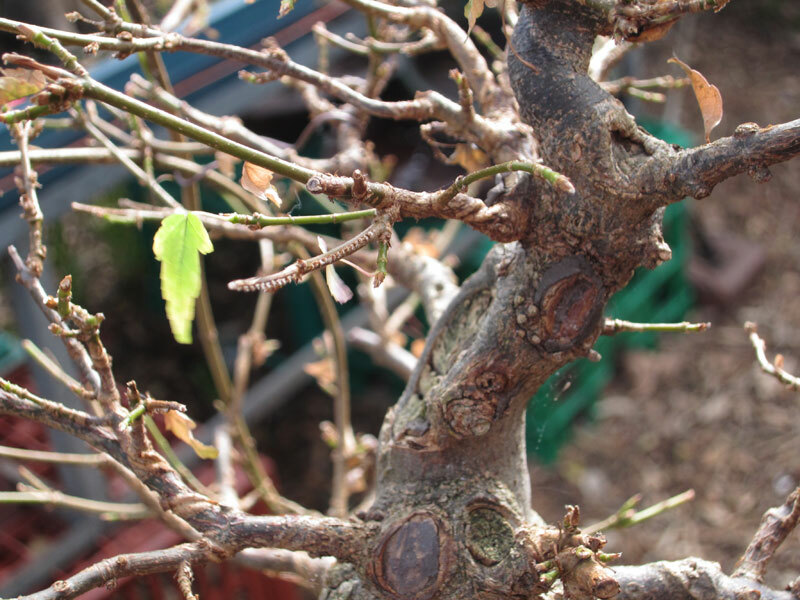 One of the other things i am trying to achieve with this defoliation is to pop a bud that is between the first and second branches on the back of the trunk. There is a bud there that has slowly been getting bigger and bigger but has not yet formed a shoot. Hopefully this work will be the catalyst that sees the bud grow a branch right where i want one. Those who look closely will notice one of the shots seems to have been bent back in towards the trunk. This is a thread graft that i have put in place to fill a gap in the canopy. Hopefully by the end of this season the branch will have grafted onto the trunk and will have begun to ramify. I look forward to seeing this tree progress over the course of the summer and hopefully it will reward me with some nice autumn colours.